This is Part 4 of “Let’s Discover Your Author Brand” using Emlyn Chand’s and Robb Grindstaff’s book Discover Your Brand: A Do-it-Yourself Branding Workbook for Authors. I’ll refer to the book from now on as “Discover Your Brand”. For those interested here are Part 1, Part 2, and Part 3. In Part 3, we looked at discovering patterns in your fiction writing interests. This involved grouping the ideas you came up with in the earlier parts and looking for common themes. In this post I examine Chapter 4, which is concerned with visualizing your readers. I confess I was a bit disappointed in this chapter, for reasons I will discuss, but overall I felt it still holds value. 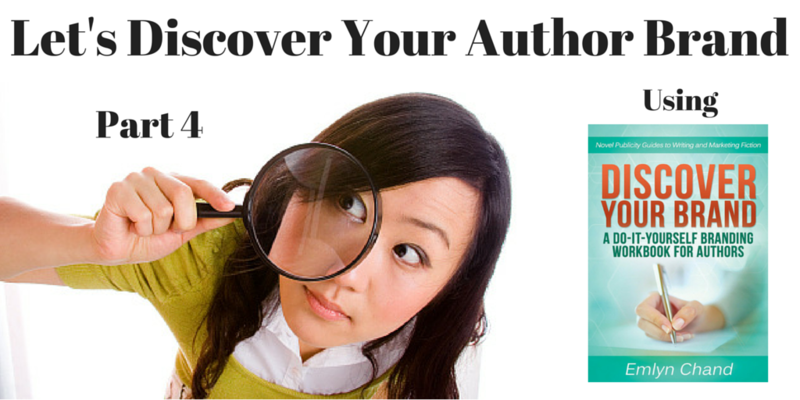 In chapter 4 we meet our readers — a key step in determining our author brand. The chapter begins by describing some methods of doing this, including researching favourable reviews of similar types of books on Amazon and Goodreads, and talking to people both online and in real life. None of these methods is very rigorous, which is a bit surprising as the author makes a point of mentioning her background in statistics. Moreover, the reviews method assumes that reviewers have left profile information that is a) accurate, and b) relevant as well as providing reviews that also give pertinent information. All of the methods described implicitly assume you have a lot of free time collect enough data from which to draw valid conclusions. The most promising method of reader research suggested is googling your genre and “readers” and “demographics”. This research method can also be used with other genres of course. For example, googling “science fiction”, “readers”, and “demographics” will return results pointing to a number of blog articles and demographics discussions. Keep in mind that topics like “science fiction” and “fantasy” are quite general. If you are writing urban fantasy with a strong female protagonist, you’re not like to find poll results around that particular sub-genre. You’ll have to draw inferences from the more broadly-based demographic information available. One thing NOT mentioned by the author is the possibility of creating your own poll. if you have a lot of twitter or blog followers, this is an option. This is what Mark Lawrence did and is a subject worthy of its own post. Hmmmm…. Demographics research is merely a means to an end. The author of “Discover Your Brand” intend that the information gleaned is used to answer a list of questions that will help define the “representative reader for the whole of your potential audience”. What ethnicity is your reader? Does your reader prefer ebooks or paperbacks? Addressing these questions can be difficult and frankly many of the answers will be no more than a guess, even with demographic data to guide you. The author states that “determining the likes and preferences of your readership will become easier as you interact with them”. Left unanswered is the question of exactly how you will be able to interact with them. Presumably she means through Twitter, Facebook, blog/forum comments and similar methods. Again, all of this will take time. After you have answered the questions you should have a fairly good idea of your representative reader’s characteristics. The next step is to examine your story ideas developed earlier. The idea is to assess the questions you asked to develop your representative reader and determine if any of the answers would change, based on considering your story ideas. You are to see if you can modify any of your story ideas (e.g. setting or protagonist gender) in order to better target your representative reader. This statement puzzles me. Presumably one writes the stories one wants to write and then determines the brand and audience. The author seems to be suggesting that the stories you want to write be modified in order to appeal to the representative reader you have come up with. While it can be argued that this is an iterative process — the constant refinement of story ideas to appeal to the representative reader, it seems to me that it is a case of the tale wagging the dog. In addition, it you modify your story ideas in order to fit the representative reader, I would argue that they may become story ideas you no longer wish to pursue. For example, I like story ideas with a strong female protagonist. If I were to change the protagonist’s gender to male in order to better suit my representative reader, I would be much less enthusiastic about writing it. Moreover, it could be that if I have to significantly alter my story ideas, then I have not properly identified my representative reader. My reader is male, ranging in age from 17 to 35. He is not married, and has completed at least some college education. No children, and he probably works in an IT or corporate environment. I don’t see him as being a trades person. He lives in the city, is likely Caucasian with at least a nominal judeo-christian background. He could be agnostic or atheist. He has some money to spend on books and will finish about a book a month, probably more. He has a preference for eBooks but will purchase paperbacks. He probably does not check out books from the library. He socializes both on the internet and in person and is drawn to strong women, particularly those wearing leather. I developed this profile after a few hours of perusing what internet polling information and reader review profiles I could find. I feel it’s generally accurate, though it should be refined and deepened. For example, I need to find out where on the internet my representative reader socializes and what tools he uses. In other words, I need to spend a lot more time developing this representative reader, and I believe the author of “Let’s Discover Your Author Brand” should have emphasized the time commitment necessary to develop a usable representative reader. Despite my reservations, I believe Chapter 4 is valuable in that is at least forces you think about who might purchase your book(s). It provides some useful ideas as a starting point to develop your representative reader. However, it glosses over the time commitment necessary to come up with usable information. Thanks for reading and I will see you again soon.